Haus sehr komfortabel und modern. Eine 10-minütige Fahrt vom historischen Zentrum von Angra do Heroísmo, ist es ein absolut ruhiger Ort ist, so dass Sie die herrliche Aussicht auf das Meer entspannen und genießen können und in der Sonne am Pool entspannen. Ideal, um Ihren Urlaub mit der Familie zu verbringen, mit Kindern, Paaren oder Gruppen von Freunden. Das Haus verfügt über 3 Schlafzimmer, 2 Doppelzimmer mit eigenem Bad und Kleiderschrank und 1 Schlafzimmer mit zwei Einzelbetten, die in einem Doppelbett umgewandelt werden können. Vor diesem Raum gibt es ein weiteres Bad mit Dusche. Im Wohnzimmer bietet das Sofa ein Schlafsofa für 2 weitere Personen, insgesamt 8 (gegen Gebühr). Voll ausgestattete Küche und Esszimmer ausgestattet. Wohnzimmer mit herrlichem Blick auf das Meer und die kleinen Inseln, mit Kabel-TV mit 200 Kanälen und DVD-Player. Kostenloses WI-FI zur Verfügung. Draußen können Sie auf der Veranda speisen die Landschaft und den Pool genießen. Der Zugang zum Pool hat Dichtungen, die die Bewegung der Kinder im Poolbereich zu verhindern, ohne elterliche Aufsicht geschlossen werden können. leicht Parkplatz für 2 oder mehr Autos innerhalb und außerhalb des Eigentums. The house is clean, comfortable and big enough for at least 6people (3 bedrooms each with double or two single beds). Communication with Francisco before and during our stay was always easy and he was answering very quickly (reachable via email, telephone or Whatsapp). He was already waiting at the house although we were arriving a little bit earlier as planned. We were informed in advance that cleaning of the house will still take place when we arrive (it took just half an hour more), but we could already put our stuff and use the pool, so it was no problem for us. When we arrived, Francisco was showing us the house and informed us about things to do, good swimming places or restaurants. The house has a great view and you could sit either outside or in the living room watching the boats on the sea. Everything is there in the house (washing machine and dryer, toilet paper, shampoo and some things left from other People, who used the house before. So no Need to buy everything. There are also enough towels for everyone. It is situated close to Angro do Heroismo (just 15-20min by car) and you have two big supermarkets in Angro do Heroismo or Porto Judeo. There are nice sandy beaches in Angro do Heroismo or Praia da Victoria. Only thing is that you need a car, but this was clear to us in advance. We could fully recommend this house. It was really nice to stay there! Thank you for your words! It was a pleasure hosting your family. The house was left clean and tidy! I´ll welcome Nicole and her family in my house anytime! Great location. Host was wonderful. Lots of room. Everything was in working order. Would stay ar the property again. June and family were really nice guests and very friendly, it was a pleasure to host them and they are welcomed whenever they want to come and visit the Azores again! Fantastic Property with a warm and hospitlable host , Helio. This home in Feteira, near Angra is fully appointed and has a fantastic view of split rock from great elevation.... It is more than advertised and close to everything to do on Tercierra.. The owner and host , Helio made the week very enjoyable and they were beyond helpful and very kind.... It made out first trip to the Azores a delight and really enticed us to return. Helio( phonetically LU) and his wife Tita are very special people and I hope future guest are about to enjoy them as we did... Enjoy the islands!!! Peter and Doreen from Maine!!! Our "piece of heaven on earth"
Three female friends had the pleasure and privilege of staying at this lovely villa during September for six nights. The villa was beyond our expectations, weather was so very warm and inviting, owner of villa went out of his way to ensure we had a most "memorable" vacation and we did! Having the pleasure of waking up every morning to the most awesome views was beyond imagination. We rented a car and set out each day to experience this beautiful island. We visited the volcano and climbed down to the bottom to experience its wonders of nature. We swam in lava pools in Biscotti and Port Martins. Some of our favorite restaurants were: Buzius Restaurant on ocean at Port Martins - Caneta Restaurant in town of Tavares - Beira Mar Restaurant in Sao Mateus. We also attended "running of the bulls" in one of the villages where the locals welcomed us and actually took us to local bars and insisted on buying us drinks, etc. Please be sure to experience this islands "signature dish" called Alcatra. We were fortunate to have this dinner at our villa which we named "Villa Franciso". The dinner was prepared by a local woman in the village and it was WONDERFUL. I could keep on commenting but I'm sure those of you reading this will realize that the three of us had a most wonderful time and will look forward to returning one day for sure............................... "Obragada Francisco"....Jane - Sandra and Peg.. This house surpassed our expectations! Truly amazing! On a dead end street with just two neighbours around we loved quiet and peacefulness you will encounter. The home has 3 bedrooms, the master bedroom has ensuite as well as the bedroom in the lower level. The third bedroom with the 2 single beds has a washroom across the hall. The best thing about ALL the bedrooms is that they all have an amazing view of the Ilheus das Cabras and the Atlantic Ocean. My favourite part of the house was the balcony/terrace area where we enjoyed our breakfast daily overlooking that view. It was a pleasure hosting Frank and Mary! They were really nice guests and left the house very clean and tidy! i´ll host them again at any time, they are very welcomed! Beautiful views modern clean home easy access to road great restaurants!!! We loved the home and Francisco was very helpful upon arrival. The house was clean, modern, and comfortable for all eight of us. 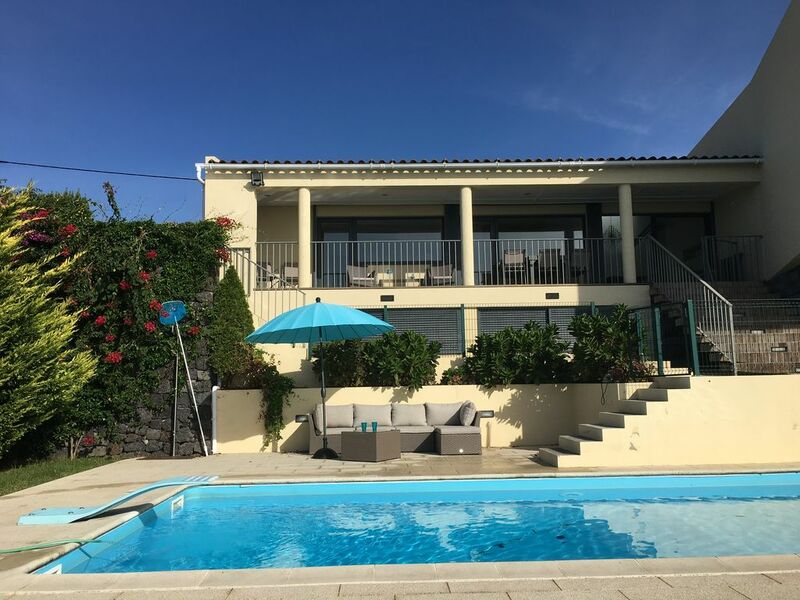 Terceira is not to be missed and this home will compliment a perfect vacation. It was a pleasure hosting James and his lovelly family! Easy comunication, and they left the house impecable! Doors are open whenever they want to visit Terceira Island again!